... but please watch Richard Heinberg's " Peak Everything" videos below, you wont regret it ! It's becoming clearer virtually every week that the issue of AGW, and specifically methane emissions, are far ahead of the scientists. That's natural enough; it takes time to conduct, write up and get published the work they do. But I'm not even talking about that. Our full comprehension of the vast network of feedbacks and underlying conditions is way behind where we need it to be. This is evidenced by the constant flow of, "Wow! We weren't expecting THAT for x years/decades/centuries!" I wrote in the spring/summer about, first, the ice melt and, second, methane. I predicted then the problem was huge and would be getting larger. The evidence so far is exactly as stated. I hope people will start to see that this AGW thing is not a far-off problem. It is concurrent with the economic and energy crises. Failing to realize this and act accordingly has a high probability of making any hope of managing the Perfect Storm but a fairy fart in a hurricane. The NSIDC October 2nd press release held no surprises if you have been paying attention to the unfolding drama in the Arctic this summer, but many certainly haven't been – despite the intense coverage since the 2005 extreme melt. Since then we've had three more melts well below the long term average. The ice extent for 2007 stands as the lowest since satellites have been used, but that occurred with perfect conditions for ice melt: high temps, storms, unfavorable winds pushing ice out of the Arctic, and more than usual sunlight. This year's melt nearly matched 2005 despite near-perfect conditions for ice retention. Alarm bells? There must be a lot of energy stored up somewhere, and that somewhere is in the water. Not nearly as well-covered is the issue of ice mass. The numbers are not yet in, but it appears 2008 will exceed 2007 for the lowest level of total ice. This is important because it speaks to the Arctic's ability to rebuild during winters. It also speaks volumes about our ability, as a species, to get excited about what is not important and ignore what is. I.e., ice mass is the number that tells you how much ice there actually is, but extent gets all the action. I assume it has to do with dramatic pictures. It's hard to make ice thickness interesting, while ice extent makes an easy, and striking, model for ice melt. The changes are so obvious. 1. This year was the second lowest ice extent on record, behind 2007. 2. The three lowest extents on record have occurred in the last four years. 3. The TREND is overwhelmingly downward. 4. The decreasing albedo (reflection of sunlight) is heating the water itself, leading to more melt from below the ice and at the edges. 5. The current year likely will be the lowest measured ice mass, despite the larger ice extent, reflecting the massively reduced amount of multi-year ice, and particularly very old ice over the last four years. 6. There were perfect ice conditions this summer, as opposed to perfect ice melting conditions last summer, yet the melt was very similar. This indicates strong feedbacks present in the system. This may be the most salient point. 8. New measurements of the Arctic permafrost indicate the amount of carbon stored there is 2x the current amount of atmospheric carbon. This is much more than previously believed. 9. Methane concentrations in the atmosphere have been rising the last two or three years after a ten year plateau. 10. The pattern of melt, peeling back from the landmasses relatively uniformly where there is more permafrost, may indicate the effects of methane/CO2 release from tundra-based and seabed-based carbon/methane clathrates. 11. The warming in the tundra extends 1,000 miles inland. 12. Due to the large extent of open ice, human activity is already rising in the Arctic and must be assumed to have a negative effect on sea ice. 13. Not mentioned in any article I've read thus far is the below normal ice extent in the Antarctic winter this year. These data should have the hairs on the back of your neck standing up. Underground stores of methane are important because scientists believe their sudden release has in the past been responsible for rapid increases in global temperatures, dramatic changes to the climate, and even the mass extinction of species. Scientists aboard a research ship that has sailed the entire length of Russia's northern coast have discovered intense concentrations of methane – sometimes at up to 100 times background levels – over several areas covering thousands of square miles of the Siberian continental shelf. In the past few days, the researchers have seen areas of sea foaming with gas bubbling up through "methane chimneys" rising from the sea floor. They believe that the sub-sea layer of permafrost, which has acted like a "lid" to prevent the gas from escaping, has melted away to allow methane to rise from underground deposits formed before the last ice age. They have warned that this is likely to be linked with the rapid warming that the region has experienced in recent years. Methane is about 20 times more powerful as a greenhouse gas than carbon dioxide and many scientists fear that its release could accelerate global warming in a giant positive feedback where more atmospheric methane causes higher temperatures, leading to further permafrost melting and the release of yet more methane. The amount of methane stored beneath the Arctic is calculated to be greater than the total amount of carbon locked up in global coal reserves so there is intense interest in the stability of these deposits as the region warms at a faster rate than other places on earth. Orjan Gustafsson of Stockholm University in Sweden, one of the leaders of the expedition, described the scale of the methane emissions in an email exchange sent from the Russian research ship Jacob Smirnitskyi. "We had a hectic finishing of the sampling programme yesterday and this past night," said Dr Gustafsson. "An extensive area of intense methane release was found. At earlier sites we had found elevated levels of dissolved methane. Yesterday, for the first time, we documented a field where the release was so intense that the methane did not have time to dissolve into the seawater but was rising as methane bubbles to the sea surface. These 'methane chimneys' were documented on echo sounder and with seismic [instruments]." At some locations, methane concentrations reached 100 times background levels. These anomalies have been seen in the East Siberian Sea and the Laptev Sea, covering several tens of thousands of square kilometres, amounting to millions of tons of methane, said Dr Gustafsson. "This may be of the same magnitude as presently estimated from the global ocean," he said. "Nobody knows how many more such areas exist on the extensive East Siberian continental shelves. "The conventional thought has been that the permafrost 'lid' on the sub-sea sediments on the Siberian shelf should cap and hold the massive reservoirs of shallow methane deposits in place. The growing evidence for release of methane in this inaccessible region may suggest that the permafrost lid is starting to get perforated and thus leak methane... The permafrost now has small holes. We have found elevated levels of methane above the water surface and even more in the water just below. It is obvious that the source is the seabed." The preliminary findings of the International Siberian Shelf Study 2008, being prepared for publication by the American Geophysical Union, are being overseen by Igor Semiletov of the Far-Eastern branch of the Russian Academy of Sciences. Since 1994, he has led about 10 expeditions in the Laptev Sea but during the 1990s he did not detect any elevated levels of methane. However, since 2003 he reported a rising number of methane "hotspots", which have now been confirmed using more sensitive instruments on board the Jacob Smirnitskyi. Dr Semiletov has suggested several possible reasons why methane is now being released from the Arctic, including the rising volume of relatively warmer water being discharged from Siberia's rivers due to the melting of the permafrost on the land. The Arctic region as a whole has seen a 4C rise in average temperatures over recent decades and a dramatic decline in the area of the Arctic Ocean covered by summer sea ice. Many scientists fear that the loss of sea ice could accelerate the warming trend because open ocean soaks up more heat from the sun than the reflective surface of an ice-covered sea. OTTAWA (Reuters) - A huge 19 square mile (55 square km) ice shelf in Canada's northern Arctic broke away last month and the remaining shelves have shrunk at a "massive and disturbing" rate, the latest sign of accelerating climate change in the remote region, scientists said on Tuesday. They said the Markham Ice Shelf, one of just five remaining ice shelves in the Canadian Arctic, split away from Ellesmere Island in early August. They also said two large chunks totaling 47 square miles had broken off the nearby Serson Ice Shelf, reducing it in size by 60 percent. Mueller said the total amount of ice lost from the shelves along Ellesmere Island this summer totaled 83 square miles -- more than three times the area of Manhattan island. The figure is more than 10 times the amount of ice shelf cover that scientists estimated on July 30 would vanish from around the island this summer. Open water now stretches all the way round the Arctic, making it possible for the first time in human history to circumnavigate the North Pole, The Independent on Sunday can reveal. New satellite images, taken only two days ago, show that melting ice last week opened up both the fabled North-west and North-east passages, in the most important geographical landmark to date to signal the unexpectedly rapid progress of global warming. Last night Professor Mark Serreze, a sea ice specialist at the official US National Snow and Ice Data Center (NSIDC), hailed the publication of the images – on an obscure website by scientists at the University of Bremen, Germany – as "a historic event", and said that it provided further evidence that the Arctic icecap may now have entered a "death spiral". Some scientists predict that it could vanish altogether in summer within five years, a process that would, in itself, greatly accelerate. GENEVA (AFP) - The United Nations said Monday that swathes of mountain ranges worldwide risk losing their glaciers by the end of the century if global warming continues at its projected rate. The UN Environment Programme (UNEP) said in a report that whilst nature has always observed a certain periodic rate of deglaciation, the current trends observed from the Arctic to Central Europe and South America are of a different order. "The ongoing trend of worldwide and rapid, if not accelerating, glacier shrinkage on the century time scale is most likely to be of a non-periodic nature, and may lead to the deglaciation of large parts of many mountain ranges by the end of the 21st century," the report warned. The world's coastal oceans are in crisis, with oxygen-starved ''dead zones'' increasing by a third in just two years as global temperatures increase with climate change, according to the International Whaling Commission's latest scientific report. Dead zones, caused by over-enrichment of waters by nutrients from run-off, sewerage and warming waters, represent ''the worst-case scenario for coastal biodiversity'' and are the ''severest form'' of ocean habitat degradation, the report says. 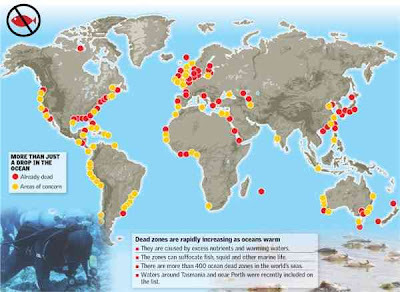 The number of ocean dead zones has grown from 44 areas reported in 1995 to more than 400, with some of the worst oxygen-starved areas extending over 22,000sqkm. Recent figures from the United Nations Environment Program estimate fertilisers, sewage and other other pollutants, combined with the impact of climate change, have led to a doubling in the number of oxygen-deficient dead zones every decade since the 1960s. The growing list of dead zones includes waters in the Gulf of Mexico, South China Sea, Gulf of Finland, Adriatic Sea and areas of the Caribbean. The Black Sea between south-eastern Europe and Turkey which has one of the largest dead zones in the world, had 26 commercial fish species in the 1960s but now has only five. A recent study listed New Zealand's oldest marine reserve, Cape Rodney, as one of the world's 10 worst-affected areas, and also listed coastal areas near Perth and around Tasmania both areas on whale migration routes as areas of emerging concern. The commission's 2008 State of the Cetacean Environment Report lists a growing number of concerns over the impacts of climate change and ocean pollution on the world's whales, dolphins and porpoises. The report says low-oxygen waters at depths of 300m to 700m have expanded in tropical oceans over the past 50 years as the oceans warm. Areas previously rich in oxygen have become ''oxygen minimum zones'' containing less than 120 micromoles of oxygen per kilogram of water. It says these reduced oxygen areas will have ''dramatic consequences'' for marine ecosystems because fish, squid and crustaceans cannot survive in them. The worst-affected areas are in tropical regions of the Atlantic Ocean, west of Africa and the equatorial areas of the Pacific . The commission's report says skin diseases are now more frequent among whales and dolphins and may be linked to ocean pollution or climate change. It says ocean surface warming and the southward displacement of Southern Ocean currents will reduce the feeding grounds of humpback, blue, fin, sperm and southern right whales. Climate modelling shows 30 per cent of ice cover will be lost in the West Antarctic Peninsula and the Weddell Sea. Whales will need to travel much further to reach the retreating Southern Ocean fronts. There's a 'big gorilla hiding the closet' whose collapse could have a dramatic effect on sea levels, according to Australian researchers. Dr Bradley Opdyke, a paleoceanographer from the Australia National University (ANU) believes the West Antarctic Ice Sheet (WAIS) could partially collapse within 20 years, resulting in a dramatic jump in sea levels. “Adapting to climate change will involve everything from changes in crop varieties, through to improved seasonal forecasting, up to revised national policies and programs,” he said.